NuDawn Sparkle Cleaners also provides alterations for any type of clothing item. 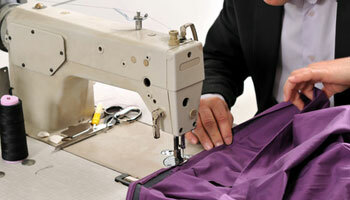 We have an offsite seamstress who specializes in alterations and works with us to provide them for our customers. From jeans to prom dresses, we work with any type of fabric and clothing item. Our alterations services include shortening pants that are too long, taking in clothing that is too big, letting out articles of clothing that are slightly too tight, and customizing the fit of tuxes, suits, sports coats, dresses, and other formal clothing. We also sew on replacement buttons, replace zippers, fix snaps and hooks, and provide any other type of clothing repair such as closing seam rips and fixing small holes. In addition to our standard alterations, NuDawn Sparkle Cleaners also provides specialty alterations for wedding gowns. This include shortening or adding length to the skirt or train, taking in the corset or adding fabric, or customizing a dress off the rack to make it more your own. Ask our staff for more details about wedding dress alterations, or bring in your dress and we can quote you a price for the alterations you need. If you have one or several clothing items you need modified to fit you better, contact us or stop in the store today.